In context of a lot of spammers trying to sign up, I would like to advise new members to keep their username based on their actual name or something to do with aviation. It will help us identify the real guys. For some weird reason, I am not getting email seeking new account activation. They are also not appearing in my Junk Mail folder. The service provider confirms that mails to Yahoo are bouncing back. 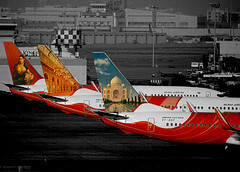 Therefore, I would advice members signing up to send me a line at indiaairliners @ gmail.com .